The Seattle Seahawks confirmed Monday they have agreed to terms on a contract with Pete Carroll to become their next head coach. “We are excited to add Pete as our coach,” said CEO Tod Leiweke in a statement. “He brings a great passion for winning and a positive attitude that is contagious. We now turn our full attention to the hiring process for a general manager. 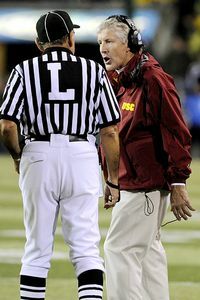 Carroll is jumping ship at USC just in time. The school is facing NCAA sanctions in the not too distant future. How will Carroll do with the Seahawks? He’s had two chances in the NFL already, with the NY Jets and New England Patriots. Carroll’s combined record over 4 years with those teams was 33-31, hardly spectacular. What those other coaches eventually learned is that there is a substantial difference between leading grown men and leading boys who are becoming men. Like Carroll, most of those coaches came from places where they had dictatorial power and a gift for nabbing hordes of talented players who could elevate their programs. The NFL is different. It’s easy to suffer through lousy personnel moves that haunt your franchise for years and even easier to end up with players who don’t respect you. Carroll should know this last fact better than anybody. He never became a top head coach because the perception was that he was too soft. As much as his hypercaffeinated, rah-rah nature excited college kids who gravitated to his affable personality, it had an opposite effect in the league. The players didn’t merely see a players’ coach. They saw a pushover, which is the last thing an NFL head coach can afford to be. Seattle will still be struggling in 2013 and again looking for a new coach to lead them out of the wilderness.